You tell us we're small, but from this way of life we have become big. Without Palestine, what does childhood mean? 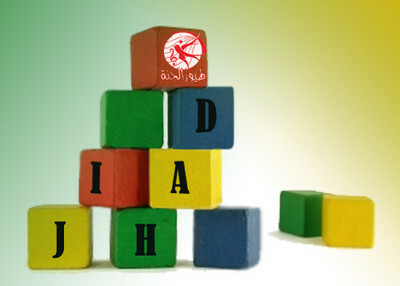 This is not a song from Hamas television in Gaza, nor is it a Hizballah anthem. "When We Seek Martyrdom" is the latest hit from a production house called Birds of Paradise. It is racking up millions of hits on Arabic and worldwide websites. Birds of Paradise, which appears to be based in Jordan, is quickly becoming one of the most popular children's groups in the Arab world. Youtube, has dozens of editions and edits of the video, ranging from Arab parents having their children parrot the lyrics to Jihadists using it as background music in terrorist videos. "[Birds of Paradise] is one of the most widely distributed children's songs group in the Arab world, and it seems to have crossed the ocean to Canada and Britain," wrote journalist Fawzia Nasir al-Naeem in the Saudi Arabian newspaper, Al-Jazirah. "Birds of Paradise" represents a new wave in Jihadist youth indoctrination. It is far more professional, better edited, and presented in a much more kid-friendly style than previous Jihadist children's programming. The themes are easily digestible even for toddlers. Child actors portray Israeli soldiers, all wearing yarmulkes, who ruthlessly gun down other children shown playing and dancing. Minutes later, the kids exact revenge and kill the soldiers. "When We Seek Martyrdom" encourages children not simply to throw rocks, but to carry out militant attacks and to ambush Jews. It even broadcasts clips of the children carrying out practice attacks. Violence is not only the answer for children, but it is framed in a cute, kid-friendly way. "It encourages the use of arms, killing, explosives, shedding blood and terrorism with all its synonyms. Our children parrot what they hear, and it enters their minds. This data is filed away, and over time it ripens into beliefs and principles which they believe in whenever the intensity is strong, so that when the dream is achieved, an explosive belt is put on, and he begins to proclaim the Jihad, which Allah revealed as his mandate…So, mother, open your half closed eyes to the bitter reality. Look at those who share with you in educating your children, and divert them from the right path. Lose the "Birds of Paradise" and other birds you and your sons are the 'firewood of hell.'" The message of the video is directed at toddlers up to elementary school ages, the precise period of a child's life where they tend to copy educational materials as mental facts. Kids of these ages cannot process issues which contain subtleties and nuances. Thus, the material imprints itself into their memory as a part of 'what is normal,' said child psychologist Joan Lachkar. "Smaller children cannot organize the data of experience into concrete and abstract categories, as opposed to older children who possess abstract thought and wider varieties of mental decision making. This video is particularly dangerous in the shame/honor system of the martyrdom ideology, because it represses the child's ability for freedom of thought, individuality, and creative thinking," Lackhar said. "This society is teaching its youngest children that peace is linked to the destruction of non-believers and that violence is an acceptable and even preferred method of self-expression." The psychological effects of such encouragement are profound, even in at an age where the complexities of the message are not fully grasped, Lachkar said. "Children in the 'martyrdom culture' become robotic and clone-like, so much so that they are compelled not to express genuine emotions or any sense of vulnerability," she said. If they do so, they are shamed and punished. On the other hand, if they conform to the cultural standards set for them, they believe that they are good and that they will be loved." This system of violence becomes self-reinforcing and it is more difficult to break the hate which is connected to the children's earliest childhood memories. This is not an isolated video from the Birds of Paradise group, but rather part of a consistent pattern of encouraging violence. In another video, Muhammad Bashaar, the adult encouraging children in the "When We Seek Martyrdom" video, gives his own tribute to "resistance" in Gaza. His video features adults carrying out terror attacks on Israelis and a teenager throwing a Molotov Cocktail into an Israeli military position, setting it on fire. He prays for success from Allah and chants, "Victorious, as promised by Allah, we will have, we will have victory!" These videos also link children and teenagers to more sophisticated discussions of Jihad, religious hatred, and related themes. Several of the "Birds of Paradise" videos on Youtube have links to children's pages, which contain more radical material. One of the links includes pictures of dead babies with the title of the song "When We Seek Martyrdom." 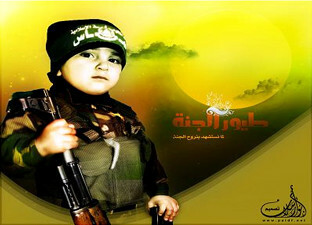 Another contains a poster of the author's son, wearing a Hamas headband. In these chat rooms, young Jihadists can link up with like-minded children, creating networks of radicalized youth. The popularity of "Birds of Paradise" children's media company suggests a disturbing trend in the Muslim world. Beyond the borders of the Palestinian territories, which already exhibit the symptoms of a "martyrdom society," there is an increasing export of children's radicalism. Caution flags are being raised in Saudi Arabia, where journalist Fawzia Nasir al-Naeem wrote, "By Allah I have heard the children's songs which they have chanted on the Birds of Paradise screen, and our children have repeated them until my head felt numb." These children, and the adults in Gaza are not Palestinians. The term "Palestine/Palestinian" was initially given to the Jews hundreds of years ago. Somehow it has morphed into meaning the Arabs who fled Jerusalem before the war. There are no Palestinians in Gaza, they are ALL Arabs. And they are Arabs who are not being absorbed into their mother countries. The mother countries don't want them, and are not willing to take them in and give them jobs because then the mother countries would lose their political pawn, the poor "refugees", who are now in their 3rd generation. The original refugees have all died. These are such beautiful children and yet so decieved by their "teachers" and get to live the life they should have !! God bless them and open their eyes !! Let those who have ears listen !! Yeah but how can we forward it on to other people that won't come to this website in order that the word is spread? So put some bloody english sub-titles on it asap!! 1: Train all your children to be mini-me, psycho-let, terrorist wanna be's...and expect the world to help feed, clothe, and provide medical care, now that all your resources have gone into creating little sociopath terrorists & bombs, not people that will help build your world. Solution? As long as *one* cartoon, tv show, radio program or social gathering that promotes terrorism, or any of its sick ilk is out there...ALL aid should be blockaided or destroyed, NO monies, relief funds or medical teams sould be sent. No wire transfers from other countries either. Total black hole ops. Solution? Use *their* rules of engagement. When a terrorist bombs a bus, we just throw a dart at a map of mosques known to ferment hatred, training camps of these sons of **** and TOT barrage the say, half a block around it. Without warning. Terror? You want it, you got it...We'll stop killing your kids, wives and families when you stop first. You deface a church or synagog? Fine, we deface yours with water cannon filled with raw sewage...get the picture? Start teaching for the future, not hatred. Start investing in the future, not Semtex, Start DEMANDING that your people act like people, rather than conniving, sneaky, cowardly psychotic little children in men's bodies and perhaps your lot will not only improve, but be a beacon for others to follow. Every religion-driven event of consequence had to have its martyrs, I don't insist on that--they have then and do now, and without fail it falls to the innocent children to provide the blood for fuel and flesh for fodder. That is one scre-filled production, but not surprise anyone today any more than "children's groups" gone before.